More than just a place for art portfolios, this website offers an entire online community for artists or anyone else interested in art. Ispyart.com makes it easy to search through all the different types of art and is completely free of charge. The portfolios do not look as professional as some other websites, but this site offers chat rooms, news updates, and various options for discovering artists and rating profiles. 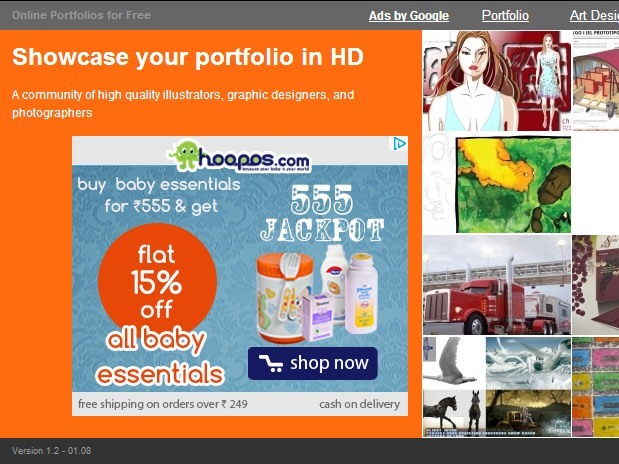 This is not only a free portfolio websites; it also offers a section for job postings. 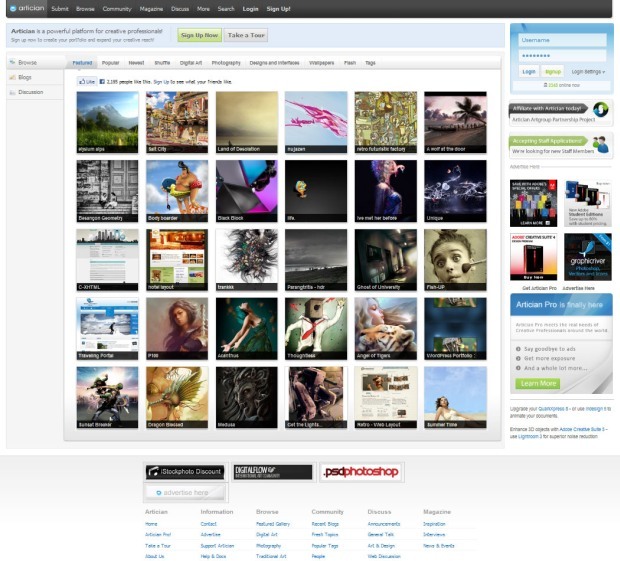 Behance.net provides very professional looking user portfolios and regularly features individual users’ artwork on their main page, providing credit and valuable exposure to the artist. The art on this site ranges from photography to watercolor to sculpture. 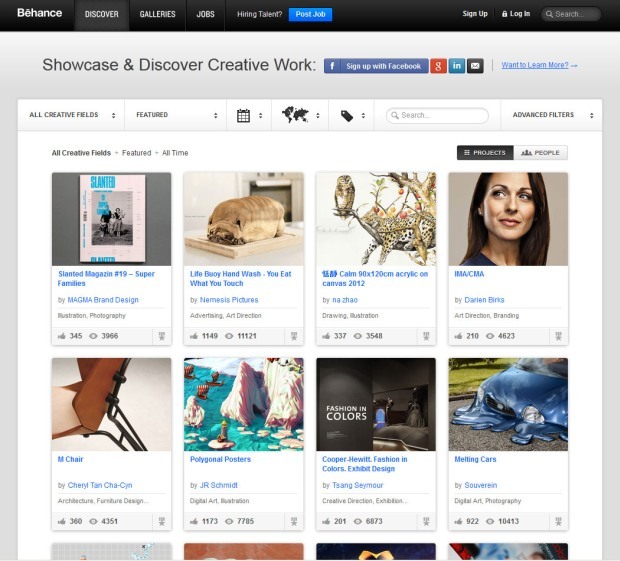 Behance is perfect for any type of artist looking for a professional looking free online portfolio. By creating a profile on this site, you are also updated on various events and activities going on in your area. 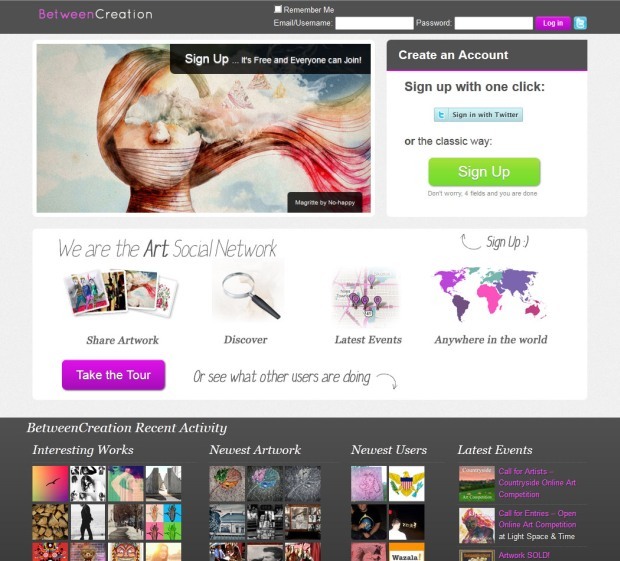 Beyond acting as a space to display your art, the site also offers a number of social networking features. Included are options to connect with other users, comment on and rate each other’s works, and receive feedback for your own work. Connect with other artists and learn about what’s new in the world of art through artician.com. This site is easy to navigate and is complete with blogs, discussion boards, and portfolios displaying many different types of art. Best of all, the site is completely free to use. 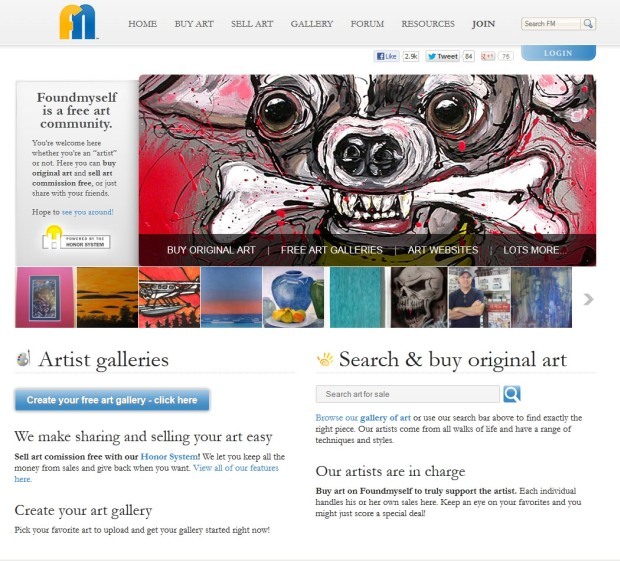 Something of a digital gallery, this site allows visitors to browse, buy, and sell art. In fact, many users of this site are not artists themselves, but have an interest in art. What differentiates the site from similar alternatives is that Foundmyself only acts as a resource to match artists with interested parties; it is not involved in purchases. This is a good site to join if you are interested in reaching a wide audience and selling your art commission free. One of the most user-friendly free portfolio sites out there, Carbonmade is especially popular among art students. The network is home to artists in a variety of areas, such as fine art, photography, illustration, web design, architecture, and digital art. 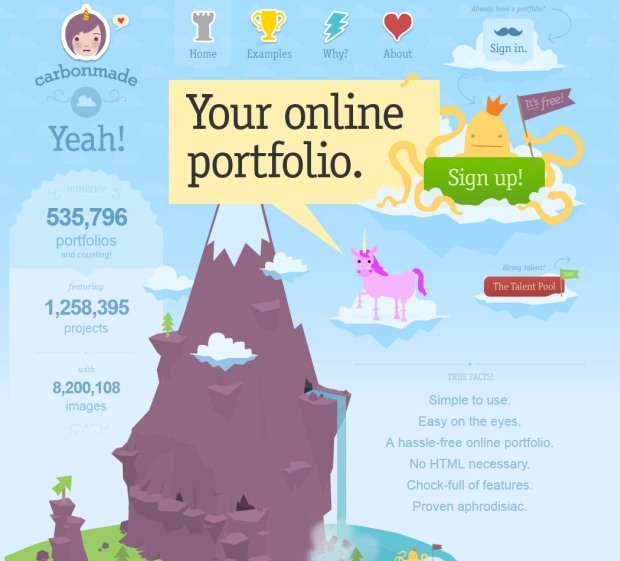 Like many online portfolio sites, Carbonmade offers both free and paid options. The free account option, charmingly known as “Meh.”, allows users up to 5 projects and 35 images total. Upgrading to the paid version, “Whoo!” results in a tenfold increase in the number of available project slots, up to 500 images, and the ability to upload videos (maximum of 10). Among the other perks of paying $12 per month? You can now use the site ad-free, take advantage of technical support, and share flash-based projects. This is a great site for creators and appreciators of photography, digital art, and traditional art – essentially an online gallery. 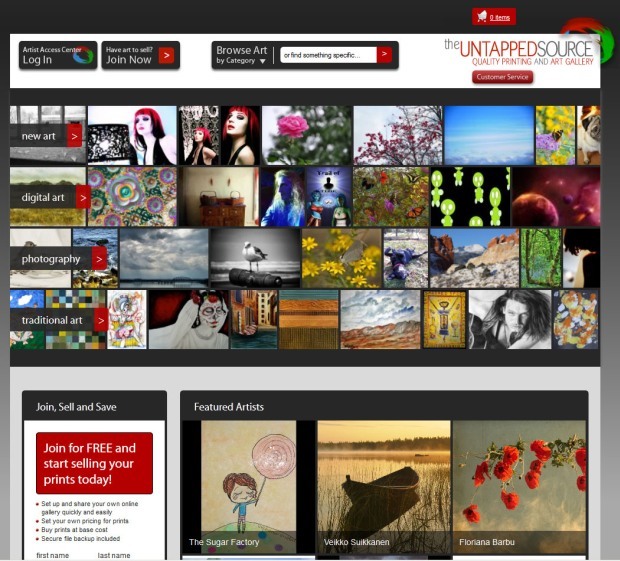 The Untapped Source is just as much an online portfolio as it is an online print store for artists. Here photographers, painters, and other traditional/digital artists can authorize prints of their works. Their patrons can order prints in a variety of sizes (8×10, 16×24, 24×36…) and on a variety of media (canvas, glossy photo paper, matte…). Although only the trial is free, Artspan is an option worth considering for artists willing to pay $12 to $18 per month. The benefits of this website include the ability to see who visits you profile, the freedom to upload unlimited pieces of art, and the benefits of maintaining creative control over your profile. 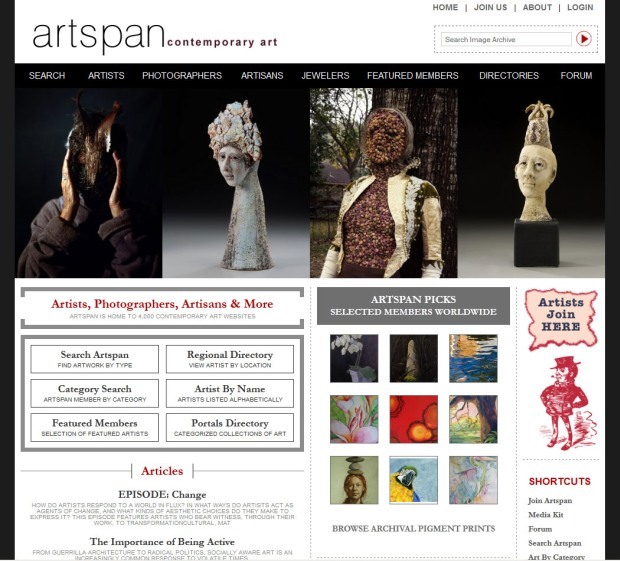 Unlike most online portfolio options, Artspan sites have their own domain names. Unlike a completely self-hosted site, though, their main site features member work on different sections of the site, acting as a portal to individual portfolios by keywords, categories, and so forth. Additionally, there are various features available to facilitate selling artwork. Although posting a portfolio on this site in not free, Coroflot does offer a free trial. The portfolios themselves look very clean and professional, making this site more than simply a place to post examples of your work. Indeed a main benefit of this site includes its extensive job search options. 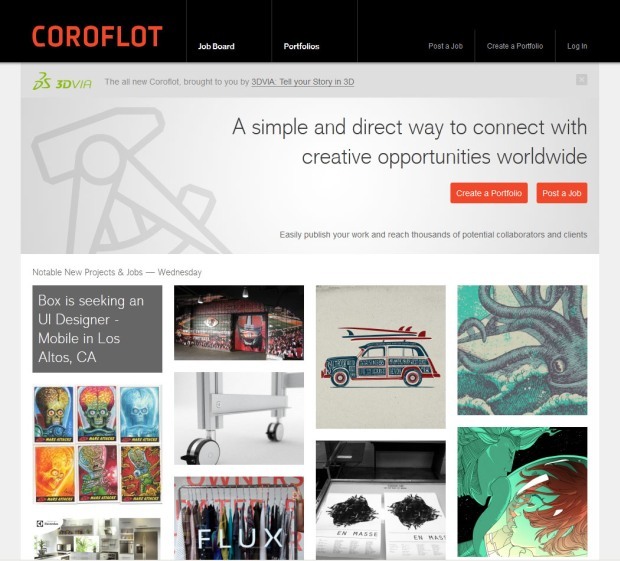 Coroflot.com is an excellent site for an experienced designer or creative professional looking for work. Similarly, it is a valuable resource for businesses seeking someone qualified to hire or for a freelance project. At the same time, for artist just starting out, I might recommend a more user-friendly and free online portfolio solution. Although it doesn’t offer the best interface or feature set, the main attraction for FigDig is that artwork can be displayed in high definition. 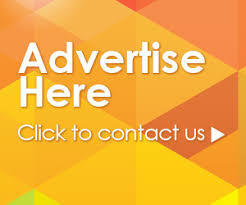 The site is completely free, although, like many other free portfolio networks, it does display advertising fairly conspicuously throughout the site. One potentially valuable feature is that FigDig allows you to turn your portfolio into a .pdf file, making it easy to print and share elsewhere. 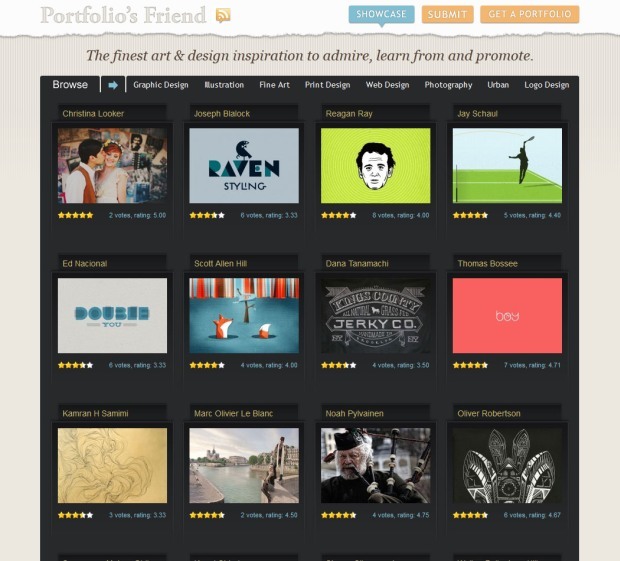 Although the site doesn’t host artist portfolios like other sites in this list, Portfolio’s Friend does bring some of the benefits and functionality to those with self-hosted portfolio sites. Creating your own website is the most professional route when it comes to an online portfolio. Furthermore, it is essentially the only option if you have a specific vision for your portfolio, need to do advanced coding, or want to maintain total control over how it functions. After creating a new self-hosted portfolio site, it can be tough work generating the same amount of traffic and attention; you just don’t have the built-in promotion and profile discovery features of, say, Artician or The Untapped Source. That’s where Portfolio’s Friend comes in; the site acts as a showcase for various art and design portfolios, allowing users to browse by category and rate individual sites. This free solution also offers the option to connect with employers. The portfolios look professional with the added flare of user customizations. 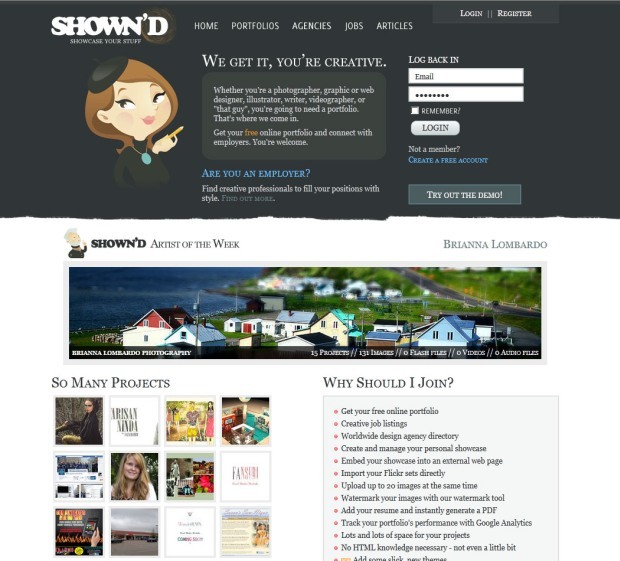 Thousands of artists and designers have created profiles on SHOWN’D, as well as over a hundred design agencies. The site is easy to navigate and is a good choice for artists looking to get their work out there. It may also be worthwhile for web and graphic design companies to create a profile on the site – to both gain exposure and attract talented job applicants. Joining dribbble.com is free and takes creating an online portfolio to the next level, complete with options to connect with other artists. 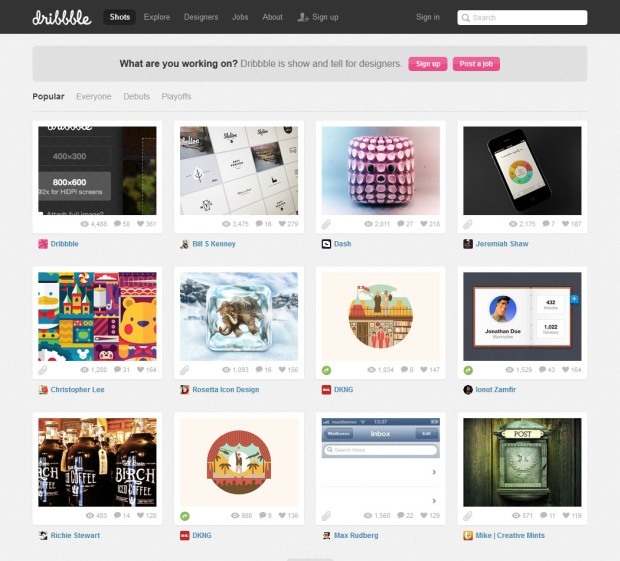 Users can follow each other’s pages, which revolve around various thumbnails or “shots” of their design work. Dribbble provides functionality similar to other sites like Coroflot and Behance, especially when it comes to getting work as (or hiring) a professional designer. Although the site features a lot of digital work, some tradition artists also maintain profiles as well. Perfect for photographers, architects, designers, and artists, this site displays everything in high definition. 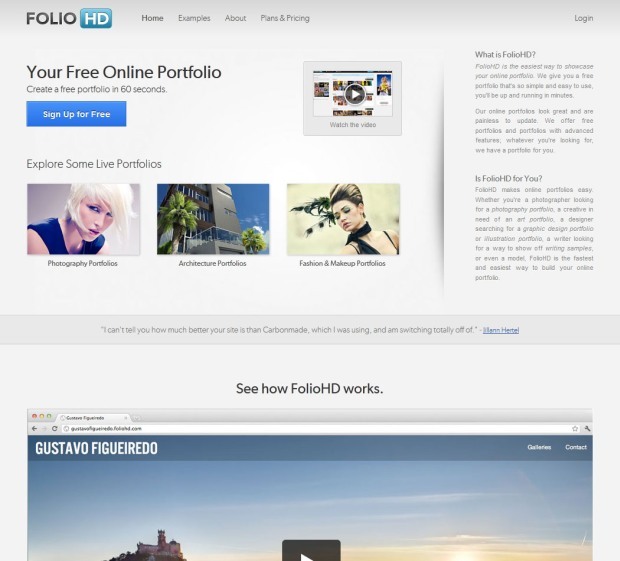 FolioHD is a popular choice among fashion designers, makeup artists, and models. Because of how easy it is to set up portfolios and since it offers basic accounts free, FolioHD is great for those just starting out with an online portfolio. If a need for something beyond basic functionality should arise, the site also offers paid options that provide dramatically higher upload limits and an array of advanced features. 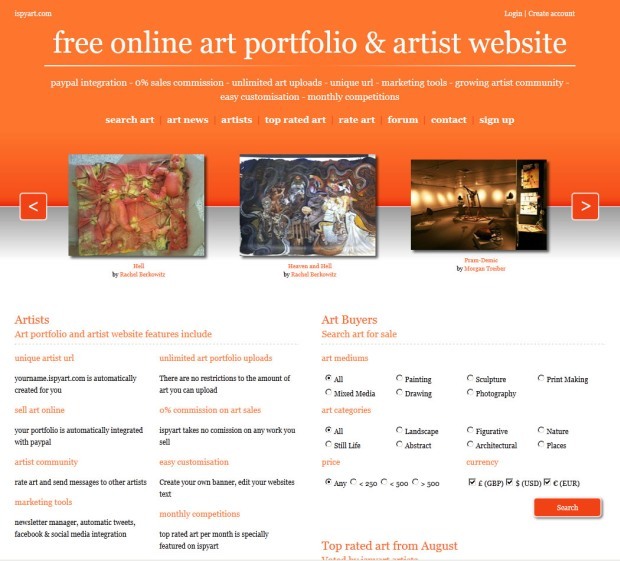 This site contains portfolios from all types of artists. It is extremely easy to search through and set up profiles. 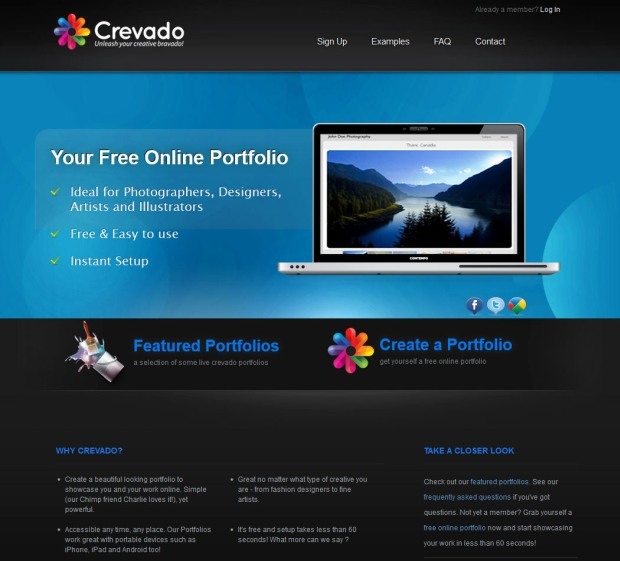 Crevado also allows users the option of buying and selling artwork. A basic membership with this site is free but there are upgrade options starting at $4 per month, which allow the artist to upload more pictures and videos, use a custom domain, sell their artwork using PayPal, create more galleries within their profile, and other functionality. Bill Kilpatrick is the project manager at Spotted Frog, a full-service graphic design and online marketing firm located in Philadelphia. For more information about the company and their work, please visit their portfolio.